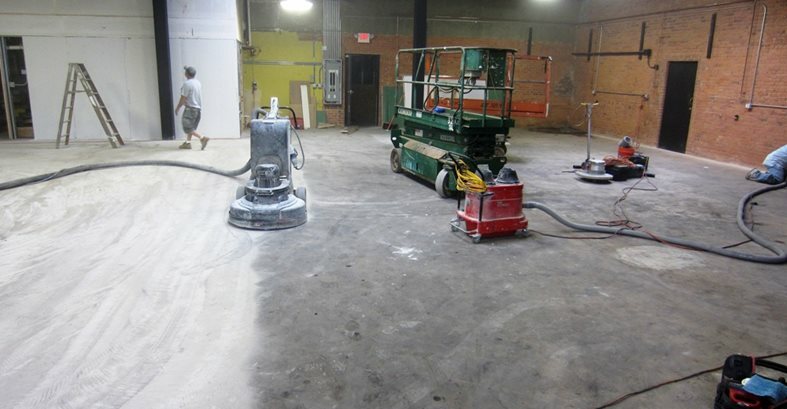 The concrete floor of an auto detailing shop gets a major overhaul By Don Pinger, Custom Concrete Solutions, West Hartford, Conn.
Before the floor could be coated, decades of grease and grime had to be removed by grinding. The lines for the parking spaces were cut with a decorative concrete saw to keep the separate coats of colored epoxy from bleeding together. 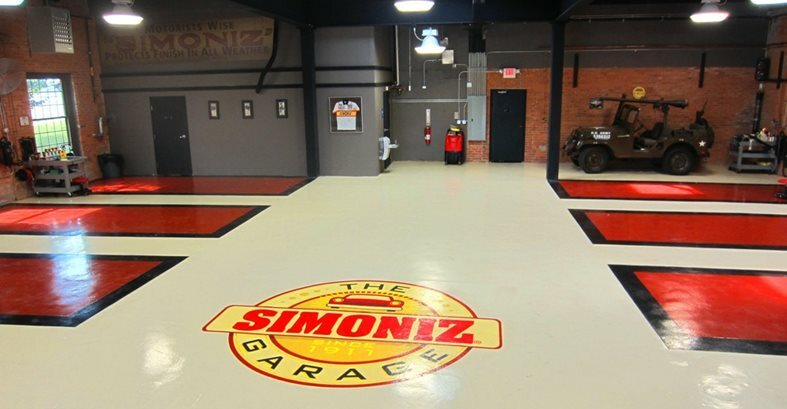 Similar to the miracle makeovers that auto detailing shops give to cars, the newly opened Simoniz facility in West Hartford, Conn., got a new high-gloss decorative finish that completely transformed its rundown concrete floor. 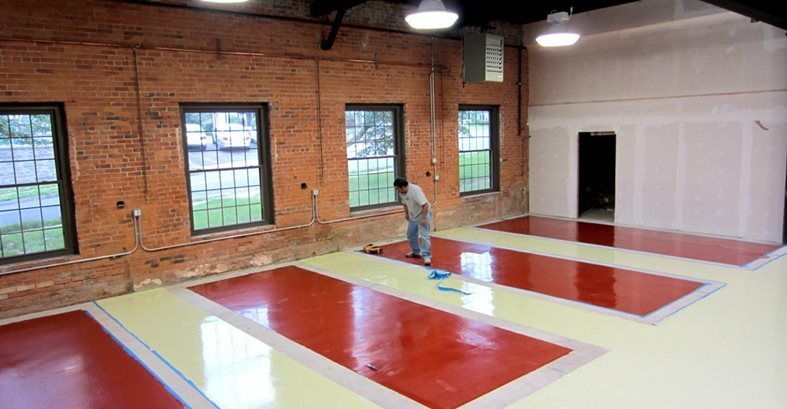 Restoring the 4,000-square-foot floor took Pinger seven days to complete and involved applying multiple coats of epoxy and a large Simoniz floor logo. “The owner wanted to create the look of individual parking spaces for when the cars come in to be detailed. Because the floors had to be able to withstand cars driving on them, we used all 100%-solids epoxies for durability. The owner also wanted us to use solid colors that matched the logo,” says Pinger. The main body of the floor was done with a 100%-solids self-leveling epoxy coating with a white base tinted a pale yellow/beige color. To define the borders and parking spaces, a pigmented epoxy in the shades of Nevada clay and black was used. Then, after the logo was applied, the whole floor was topcoated with a clear epoxy. For the logo itself, Pinger used a custom made aluminum-based decal designed to hold up under heavy traffic. “What made the project come out so nice was that we sawcut the patterns in with a lightweight decorative concrete saw prior to applying the individual coats of epoxy. It took longer to do, and we had to do one color at a time so they wouldn’t bleed together,” says Pinger. The restored floor not only looks great, it will also be easy for the owner to maintain. “Epoxy-coated floors are extremely durable and require a simple washing with water and mild soap,” says Pinger. Contractor Custom Concrete Solutions, West Hartford, Conn.